Bowling Green, Ky. – May 2, 2016 –As destinations across the country prepare for the upcoming tourist season and recognize National Tourism Week May 1-7, the Bowling Green Area CVB is celebrating the launch of its new website and also offering a hospitality training program. 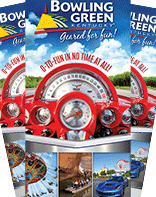 The newly redesigned and recently launched website is more user-friendly and features travel planning tools, social media widgets, themed Bowling Green itineraries focusing on the seven generations of the Corvette and more. Starting later this week, called V.E.T.T.E. (Very Enthusiastic Travel and Tourism Expert), the CVB’s one-hour training session is available throughout the peak tourism season, beginning Thursday, May 5. The free program is offered with a focus on all frontline staff members of hotels, restaurants, attractions, gas stations, retail shops and any other area businesses that may assist travelers. The curriculum includes ways to keep visitors in town longer and boost the local economy with more spending. The first session will be held at the Bob Kirby Branch of the Warren County Public Library on Iron Skillet Ct. at 3 p.m. on May 5. Remaining dates and sessions are to be determined. As an incentive to complete the program, participants receive a V.E.T.T.E. ‘passport’ granting free admission to local attractions. Space is limited and RSVPs are required by Wednesday, May 4. Find out more about the CVB and subscribe to the “What’s Happenin’” e-news to keep up with Bowling Green area events at the new www.visitbgky.com. For inquiries or registration information for the V.E.T.T.E. program, please call the CVB at 270-782-0800 or email telia@visitbgky.com.